Update May 2018: Dickey's Barbecue Pit Ventura has closed its doors after five years in business., joining the closure of Dickey's locations in Westlake Village and Simi Valley. Burgers, BBQ and Beer are all the rage these days throughout Ventura County it seems. Today in a random stop by the Ventura Dippin Dots store with my kids, I discovered the newest BBQ place in town, Dickey's Barbecue Pit. Dickey's opened on February 28th in the Victoria Plaza. Travis Dickey opened the first Dickey's Barbecue Pit in Dallas, Texas in 1941. His sons took over in 1967 and expanded throughout the Dallas/Fort Worth area. The company began franchising in 1994 and now they are all over the country. According to their website, Dickey's serves up beef brisket, pulled pork, ham, polish sausage, turkey breast and chicken, with an extensive array of home-style sides from jalapeno beans to macaroni and cheese. Buttery rolls are served with every meal along with complimentary ice cream and dill pickles. We are known for our mouth-watering BBQ smothered in smoky sauce. Dickey's offers juicy pulled pork, tender ribs and brisket. STOP THERE! Did I read, FREE ICE CREAM (with dine-in purchase)? And pickles? Sounds like a great place to bring a pregnant woman! But there's more...KIDS EAT FREE every Sunday (kids 12 and under, 1 free kid's meal for each paid adult meal of equal or greater value, dine-in only). Well I walked over at 4pm and the line was going out the door! They must be doing something right here! 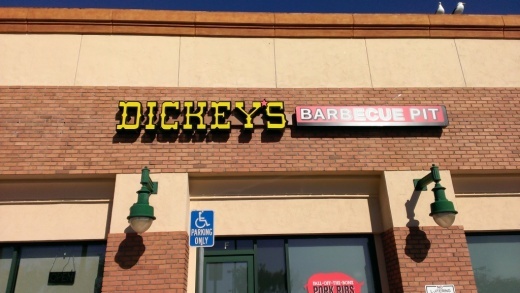 Dickey's Barbecue Pit is located at 6100 Telegraph Road, Suite F, Ventura (this was previously Pizza Mizza, which closed in mid-2011). The Dickey's Ventura website is www.dickeys.com/locator/store.php?id=599 and phone is 805.212.4240.